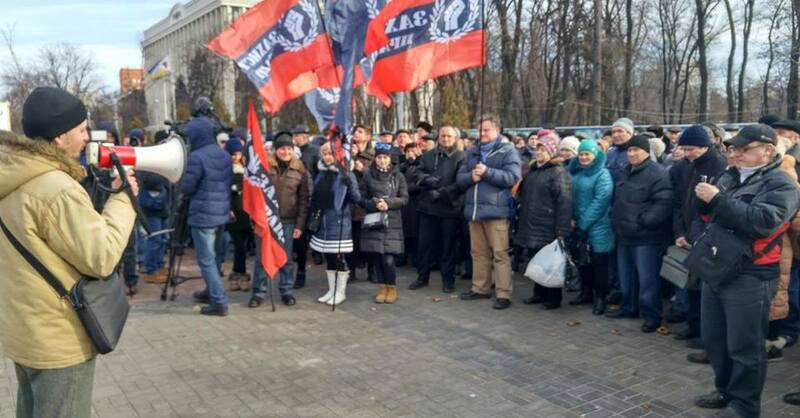 There have been large protests by workers of the Ukrainian State Enterprise “Southern Machine-Building Plant Makarov” on February 11th at Dnipropetrovsk City Council. The workers have been protesting against unpaid wages – a massive problem in Ukraine. After previous actions the workers secured some wages owed for January, however this was not all the money they were owed by their employer which cover almost four months of wages. Following their protests the workers received certain assurances and decided to suspend their protest activities. They received payment for January but workers are waiting for full repayment. Yevgen Derkach of the Defence of Labour Trade Union in Dnipropetrovsk which represents the workers said they will “We endure as two-week break and will look at the situation. If they pay the debt good, but we still have many questions about our company that we will raise, in particular, the reorganisation of the plant “. In 2015 the workers held more than ten protest against non-payment of wages in Dnipropetrovsk and Kyiv. Situation due to financial difficulties – the company lacked orders for products from state and commercial organizations. In October 2014, during President of Ukraine Petro Poroshenko said that the production of the plant will be included in the state defence order.